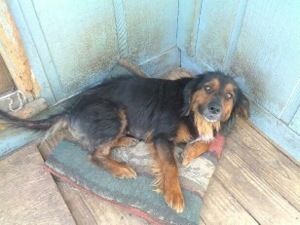 CAN ANYONE HELP PATRICIA GET THIS DOG IN TO A VET? WITHOUT THIS STEP THIS POOR DOG DOES NOT HAVE A CHANCE!! READ FROM BOTTOM UP FOR STORY. Margo, runs a massive rescue program for Memphis but the dogs have to be “adoptable” or the whole program would lose credibility. 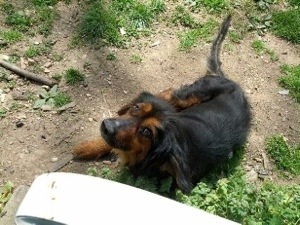 You have to help Sadie become adoptable! 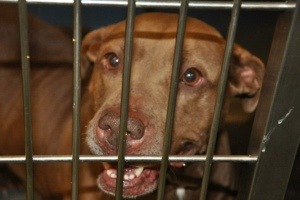 If you do not become directly involved in Sadie’s rescue it appears she is destined to live a horrible life. I’m copying a few people on this email who may be able to help you get the dog in to a vet for evaluation, spaying and HW testing. This poor dog – thrown from a truck, then kept outdoors with almost no human interaction for a year – no vaccinations or health care – then an unwanted litter of puppies that were given away by your boss’s wife. Your boss has not helped her by doing this – however good-intentioned he was. She needs to have a slip leash put around her neck and be taken to the vet IMMEDIATELY. She should be evaluated, spayed, tested for HW. If your boss is willing to pay for this – then he should do so. The vet can tell you whether Sadie can overcome her fears with the help of a trainer. If so, we can raise funds to help. 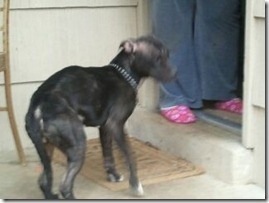 Once she is past that hurdle then find a foster home. If she gets through all of this with no problems then Margo would probably reconsider putting her in the NE program. 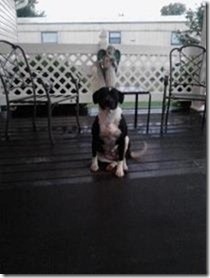 If Sadie truly has socialization issues that cannot be overcome then she is best off being peacefully euthanized. This is better than the horrible life she is living now. PLEASE don’t leave her to suffer any longer. Get her out of the situation she is in and let a vet evaluate her behavior. Get her medical care. Otherwise she will have more litters and die young of heart worm or worse. Hi Patricia, I’m afraid Sadie would not be a good candidate for long distance adoption. Folks adopting a dog sight unseen from 1000 miles away are very wary about socialization issues and afraid to take a chance on a scared dog that they cannot meet first. If his wife can pet her then she can slip a leash around her neck and take her to be spayed, because I bet Sadie is due to have another litter pretty soon if not spayed. I have not met Sadie. Rick (my boss) has had her on his property for almost a year. She was thrown out at Shelby Drive & Swinnea and his wife was able to get her out of the road at the time. They live in the trailer park right there at that intersection. She is fearful but his wife & daughter have been able to pet her, etc. He asked me for help with her back then and I posted it on my Facebook & also sent out a mass email. Nobody responded so he still has her. They provided a dog house & put food out for her but she is still considered a “stray”. And that’s where the puppies came into play. 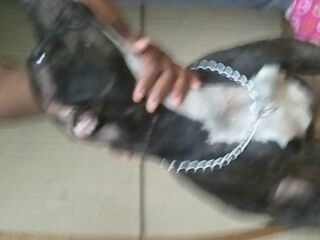 Male dogs around there wandering & they got a hold of her. I don’t want that to happen again & neither does Rick. That’s why he wants her gone – she deserves better. They love animals & would never hurt her but in the same breath, they do not want to keep her. They have a little dog that stays inside. Judy (his wife) just acted out of kindness when she got her out of the road (no injuries) and had no idea it would take this long to find a place for her. He said none of them can catch her to get a leash on her so she can be taken to the vet. I’m sure she probably runs and they aren’t used to that. We “animal world” people are. I told him I would come and bring help and we could get her. I’ve wrangled many a doggie in the past & I’m sure you have, too. I included you in my email I sent out yesterday that had a picture of her. It’s not the best picture but that’s as close as they could get without her running. She didn’t know what a camera was. I will re-forward the email that has the picture attached. Let me know what you think. I would be happy to go with you (or a representative for you) and get her leashed & let you assess her, etc. 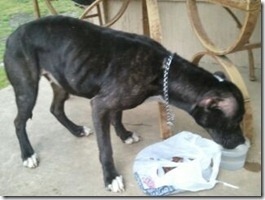 If you feel you can help, we could get her to your vet for shots, spay, heartworm check, etc. and Rick will pay for it. Thanks so much. You’re my first sign of hope for Sadie. If you need to speak with me, my cell is 901 438 6187. Hi Patricia, Sadie might be eligible for New England adoption. Can you email me a photo? You mentioned she is scared. Can you tell me more about her socialization? REPOST – I posted this back in October via email & my Facebook page and we STILL need a home for her. He has kept her as long as he can and the next stop would be the HELLter. He does NOT want to do that so he has asked for my help once again. PLEASE share/crosspost. 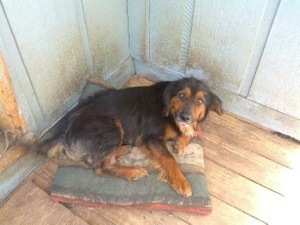 Sadie – need a rescue or adopter. She is a hound mix. Scared but not aggressive. My boss has her at his house. We have been trying for a year now to find a place for her. She ended up having puppies after he got her and his wife & daughter took them to a Walmart parking lot and gave them away. After I “came to” from having hyperventilated when I heard that, I told him to get her spayed. This has not happened yet and I don’t want more puppies! 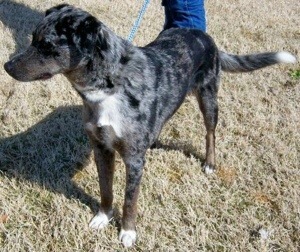 If an individual takes her, he will pay ALL expenses for her vetting/spay. If a rescue takes her, he will make a donation towards all her care. She was thrown out at Shelby Drive & Swinnea and he has been feeding her & giving her shelter but they do not have the appropriate place to keep her. PLEASE HELP! Crosspost, share, etc. If you can help, email me or call me 901 438 6187. 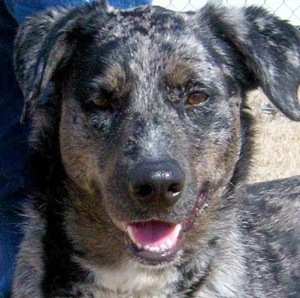 THIS WOULD BE A GREAT SHORT-TERM FOSTER THAT WOULD GIVE PEOPLE A CHANCE TO SEE HOW FOSTERING WORKS. IT WOULD PROVIDE AN EXCELLENT FOR CHILDREN WANTING A DOG BUT NOT REALLY KNOWING WHAT IT IS LIKE. IF YOU ARE A PARENT PLEASE PASS THIS ON TO SCHOOLS AND TEACHERS. We thought we had one of these lab puppies adopted, but apparently it didn’t happen. Now he is really in danger. Both puppies will be euthanized as this is a high kill shelter. 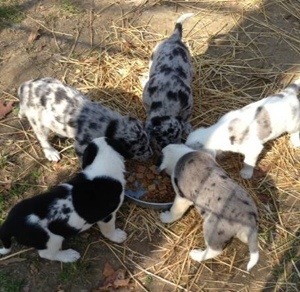 PLEASE GIVE THESE PUPPIES A CHANCE! THEY ARE BEAUTIFUL, YOUNG and HEALTHY! 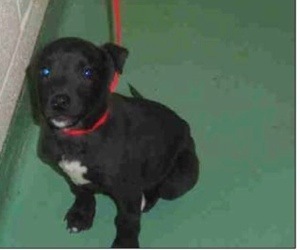 PLEASE RESCUE this 4 month old Black Lab, ID 250452 at Memphis Animal Services. They are a high kill facility with a KILL RATE of approximately 70%. 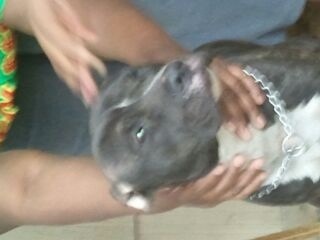 He’s in Adoption Area 35A. For more information, contact Tracy Dunlap attracy.dunlap@memphistn.gov or call 901-636-1416. Please hurry though because he’s been there since January 22. 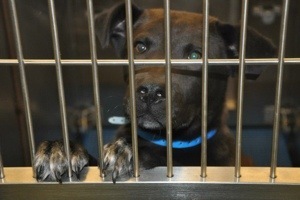 There is also a male Black Lab puppy who has been there since Feb. 3, ID 250949. He’s already been neutered. Please rescue these babies as their lives are in danger. Contact Felicia Keough via Facebook or felicia.keough@gmail.com or 901-219-4446. 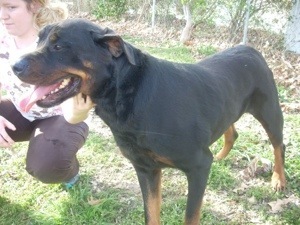 Well, it’s happened again…..A stunning neutered male Rottweiler was thrown into the back yard of a vet’s office in Memphis. The vet said the dog may be 2-3 years old. He is friendly and not hesitant or shy. His tail is docked and looks very healthy. He never uses the bathroom in his kennel and does not tear up the toys he is given. He is heartworm negative. He has been given a bordetella and 7-1. A Good Samaritan who is trying to network this dog was told he would have to be sent to Memphis Animal Services next week because he cannot stay at the vet’s office. Contact Felicia Keough via Facebook or felicia.keough@gmail.com or 901-219-4446. 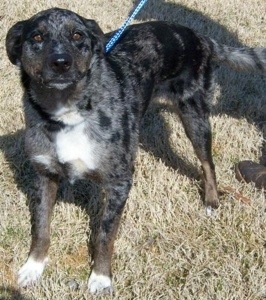 We only have until Tues or Wed evening before he is sent to Memphis Animal Services, a high kill facility. 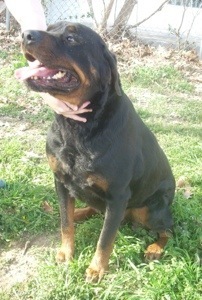 Please share this dog especially with Rottie lovers! Contact Tracy Dunlap at tracy.dunlap@memphistn.gov or 901-636-1416 if you can rescue this dog. 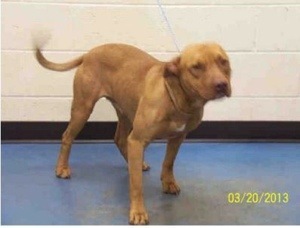 Red American Pit Bull Terrier at Memphis Animal Services needs to be rescued as soon as possible. He’s approximately 1 year old. He just got there on March 20 but in typical MAS fashion, he has been given a “Due Out Date” of Tues. March 26, less than a week. Any dog that is past the “Due Out Date” is killed at this high kill facility. An animal rescuer met “Red” on Sat. March 23 while she spent an hour and a half waiting for MAS to bring out another dog that she was pulling, (not “Red”). They actually brought her the wrong dog and tried to hand over “Red” to her. Apparently, they even gave “Red” a rabies shot and had him microchipped, which was what the OTHER dog was supposed to have. More of those “clerical errors” that continue to happen at Memphis Animal Services. As they brought “Red” out with a leash fastened around his neck tight like a noose, he cowered and shook with utter fear and urinated on the floor when the staff member holding the leash went to touch him. He seemed absolutely petrified of this place and these people. As my friend knelt down with him on the floor of the lobby, she promised “Red” that his final days were not going to be at MAS. An overwhelming feeling of guilt and panic ran through her as she knew she could not live up to her promise that day because she was pulling another dog, but she was going to do all she could to try to save him.